Patricia (Pat) Enborg and my husband, Peter Rakobowchuk met, working both as reporters on Parliament Hill, (she in fact, recently, lied on her own blog to cover up the real dates of her working on Parliament Hill, which she told years before on Gord Grant memory page. NO MONEY to go back with NOR A HOME to go back to in CANADA nor, as a Canadian citizen on a visit, ANY MEANS OF MAKING A LIVING in Hungary. Why do they have any of my past there...why didn't the send them to me when I was living in Ottawa? Ambitious Patricia became Peter's wife and later, pushed Peter into politics and the two became the "Fraud Couple". The LBPSB page, bearing Peter Rakobowchuk's slanderous LIE defaming us was changed in 2014, after SIX YEARS, but with their LIE on the net for so many years our defamation to discredit us was done, yet, NO APOLOGIES, NO CORRECTION since, that Peter Rakobowchuk a.k.a. Peter Ray is the father of THREE children, including Giselle, his first natural, legitimate daughter from his first Canadian marriage. VERSION FRANÇAISE | HOME | CONTACT USPlease send comments or suggestions to webmaster@lbpsb.qc.ca. © 2014 Lester B. Pearson School Board. All Rights Reserved. With Giselle and I living in Europe then, Patricia (Pat) Enborg, Peter's wife a communication expert must have written and posted the lie on the LBPSB website for their smear campaign against us. This PUBLIC LIE of Peter Rakobowchuk was/is used for the defamation of me and our daughter to discredit us by sending the link to this site to chosen people. Likely, Patricia Enborg has spread lies about us from The Canadian Press e-mail (IP) addresses of Peter Rakobowchuk or Peter Ray, using the reputation of (The Canadian Press-Broadcast News), his employer to get credit for their own lies. Their LIE on the website of LBPSB was kept six years accessible for the people they lied to in Hungary and Canada, like journalists and politicians. Their lie that Giselle was not Peter's daughter, was not from Canada but was a Ukranian or Russian refugee has ruined our reputation and livelihood in my own hometown in Hungary and in Canada. These two, encouraged by us having done nothing (not knowing anything about our defamation), have just recently tried to get into higher politics. Patricia (Pat) Enborg got into the limelight as campaign manager of her husband Peter Rakobowchuk, when he ran for office seeking election as Councillor for District 8 in the town of Kirkland. Patricia (Pat) Enborg did not mention in the Kirkland Citizen that Peter Rakobowchuk didn't live in District 8, she only admitted it after voters' complaining about that fact. She did not mention she was the wife of the candidate, Peter Rakobowchuk either. The Gazette: "veteran radio reporter Peter Ray cited his wife" Pat Enborg being Peter Ray, his pseudonym's wife, not a word about the prestigious The Canadian Press writer Peter Rakobowchuk. Peter claims his Twitter is a journalist's account for The Canadian Press, but accessible only to a few people. Peter Rakobowchuk aka Peter Ray, "The Canadian Press" reporter's articles, photos are being continually published in mainstream media, giving their LIES credibility, but ruining Giselle's and mine. Patricia/Pat Enborg as a former journalist.must be calling upon all her old contacts to help her. A reporter using different names at the same company, at the same time is unheard of, as unusual, as a father with a very belated denying of his own, natural, legitimate, grown up daughter's existence, with all her Canadian documents. Peter Rakobowchuk didn't want to pay child support for his own child, Giselle. His lawyer wrote Peter had to support Patricia (Pat) Enborg his new wife a young journalist, childless "career woman" with a good job in radio. I only got child support from him after the Court ordered him to pay! Less than 10% of is salary. "along the way" she married Peter Ray, a.k.a Peter Rakobowchuk my ex-husband, legal, biological father of Giselle. Peter Rakobowchuk alias Peter Ray, reporter at The Canadian Press, Montreal was for years legally married to Agota Szabo. He is the natural, legal father of Giselle, FIRST of his 3 (THREE) children. NOT TWO. 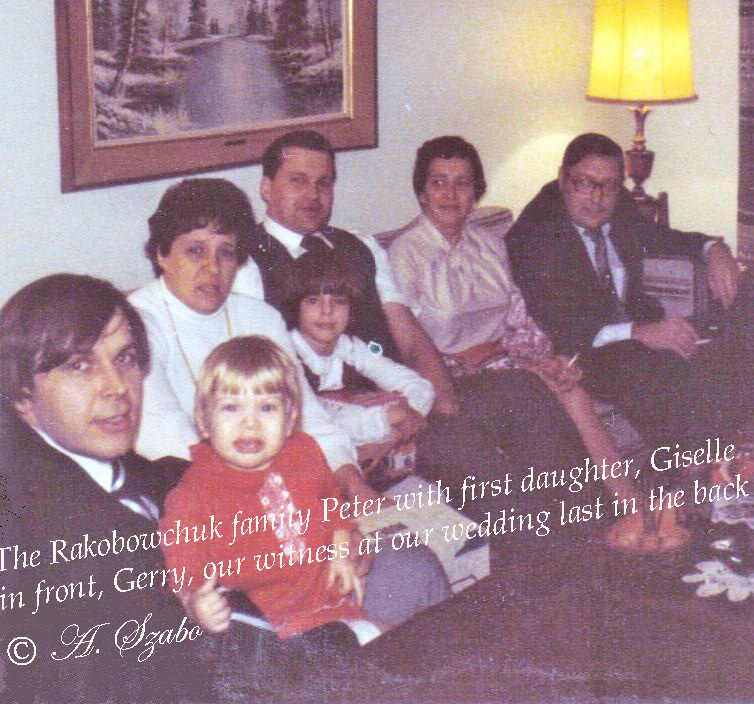 Peter and I met and married in Canada, our daughter was born in Canada and we raised her together in her first years in Canada, we were, are and always will be his first, legal and legitimate family he abandoned and left in Hungary in the eighties.